Rozsika Parker's re-evaluation of the reciprocal relationship between women and embroidery has brought stitchery out from the private world of female domesticity into the fine arts, created a major breakthrough in art history and criticism, and fostered the emergence of today's dynamic and expanding crafts movements. 'The Subversive Stitch' is now available again with a new Introduction that brings the book up to date with exploration of the stitched art of Louise Bourgeois and Tracey Emin, as well as the work of new young female and male embroiderers. 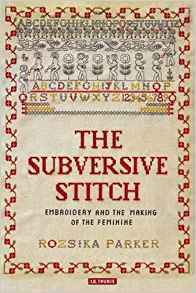 Rozsika Parker uses household accounts, women's magazines, letters, novels and the works of art themselves to trace through history how the separation of the craft of embroidery from the fine arts came to be a major force in the marginalisation of women's work. Beautifully illustrated, her book also discusses the contradictory nature of women's experience of embroidery: how it has inculcated female subservience while providing an immensely pleasurable source of creativity, forging links between women.